Monday to Friday at 12.30 pm you are welcome to join us for a healthy free lunch. Volunteers cook a delicious range of foods, with both meat and vegetarian options. Our lunches have a welcoming environment and give you the chance to meet other people and make new friends. At other times of the day, the kitchen is stocked with tea, coffee and breakfast cereals that you may help yourselves to, and you are welcome to take home anything left in our communal fridge. To help you maintain a healthy diet, the Centre has a free food store which can provide you with food items and toiletries to take home with you. It is open Monday to Thursday between 10:30 am and 2:30 pm and Friday 11am to 2pm. 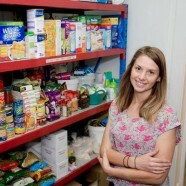 Members of the centre are entitled to shop for dried groceries once a week, and fresh food whenever we have stock. Toiletries are also available on a monthly basis. We can provide materials that help you access our services, such as swimwear or sportswear for our recreation programme, or pots and crockery to eat what you shop for at our food store. We do not generally provide clothes or children’s toys as we lack the space to store them. However, you can obtain these from your local Salvation Army or St Vincent de Paul shops who are committed to assisting asylum seekers. If you require furniture and white goods, we recommend you visit the Bower at Addison Road community centre, Marrickville, who will give discounts on their furniture to clients of our centre.